All the reviewers and bloggers I know do what they do because they love the written word, and I am proud to say that I am an inveterate book collector and an unapologetic lover of words. For this reason, I was delighted to participate in the Peachtree Publishers Cheshire Cheese Cat blog book tour. The book in question is about a cat to be sure, but it is also about a literate mouse and an author who is suffering from writer's block. Here is my review of the book. Skilley is an alley cat who lives in London and who has a secret that he has never shared with anyone. He knows that his reputation will be in tatters if any of the other alley cats find out what his secret is. Tired of life on the streets, Skilley decides to try his luck at Ye Olde Cheshire Cheese, an inn where the best cheese in London is sold. Not surprisingly, the inn has a dire mouse problem, and Skilley is sure that the innkeeper will be glad to have a good mouser on the premises. Sure enough, the innkeeper is delighted to have Skilley living at the inn, and the barmaid is even happier because she has a mortal fear of mice. What neither of these people know is that Skilley has no interest in catching and eating the mice, the reason being that he does not like to eat mice! Instead, Skilley likes to eat cheese. Soon after arriving at the inn, Skilley makes friends with a very well educated mouse called Pip. The cat and the mouse put on a performance for the humans at the inn to give them the impression that Skilley is doing a great job catching mice. In return for his protection, the mice give Skilley some of the delectable Cheshire cheese that is sold at the inn. There is one person who visits the inn, Mr. Charles Dickens, who begins to realize that all is not what it seems, but he is having trouble with his new book so he does not bother investigating. Skilley’s arrangement with the inn mice goes very well until the barmaid brings another cat to live at the inn to help with the mouse problem. Pinch is an evil tomcat who loves to dine on mice, and he is determined to eat every mouse in the inn. 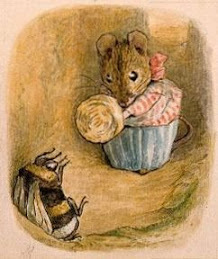 Skilley is justifiably frightened of Pinch, and he has no idea how he is going to protect the mice and his reputation at the same time. In this clever novel, the authors tell the story of a relationship between a mouse and a cat, and at the same time they also tell the story of a writer who has writer’s block, and a raven who needs to go home. It is fascinating to see how Skilley comes to terms with his own identity, and how he struggles to do the right thing for himself and for those who depend on him. Readers will be delighted to see how, in the end, the mouse, the cat, and their allies triumph in more ways than one. Why do I love words, you ask? What is inconceivable to this mouse is that one could do verbal battle in this world (as is often necessary if one is to right a wrong, woo a heart, or win back one’s cheese) without the armamentarium that is a good vocabulary! What? In plain English, you say? Have you ever had a great thought? No. A truly great thought. A thought that was bigger than yourself and clear as glass in your mind’s eye, but slippery to describe? And did you, hearty soul that you are, nonetheless try to explain this notion of yours to someone, only to find yourself stumbling about for the right words…only to find your listener looking at you as though you were speaking monkey gibberish? Well, dear friends, that is why words are so important. Last, but by no means least, I have GIVEAWAY!! If you would like to be entered to receive a copy of this delightful book, please email me, telling me why you love words. Thanks again for everything! I'm so glad you were on the tour, and I love how the post turned out!